Make the most of Jersey Royal potatoes from spring until early summer when they are in season. Grown only on Jersey, these sweet, sometimes earthy-tasting potatoes are easily identified by their long, oval shape and delicate skin. Team them with asparagus, chicken, bacon lardons and spinach to make this simple meal. Heat a frying or sauté pan, add the lardons and cook for 3-4 minutes until crispy. Remove with a slotted spoon and drain on kitchen paper. Pour away the fat and wipe out the pan with kitchen paper. Heat the olive oil in the pan and add the potatoes, tossing to coat in the oil. Cook, covered, for 30 minutes, or until tender. Shake the pan from time to time, to turn the potatoes. Cook the asparagus tips in boiling water for 4 minutes, until just tender. Drain and refresh in cold water. 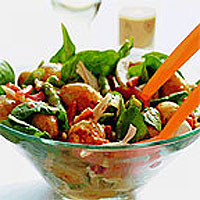 Cut the chicken into thin slices.Place the spinach into a large salad bowl, add the lardons, asparagus, chicken and the hot potatoes. Add the dressing and gently mix to coat all the ingredients. Serve immediately. Jersey Royal potatoes have a slightly waxy texture which means that they retain their shape when cooked, making them suitable to serve either hot or cold. To enjoy these potatoes at their best, buy only as you need. If necessary, store in a dry, dark cupboard for a short period only. Jersey Royal potatoes should not be peeled, however they do need to be thoroughly washed.